I've got a feeling that I have said this before-but it really isn't easy being a GP. We try our best not to over-prescribe for 'routine' viral illnesses, even when the patient clearly expects to receive an antibiotic. But every now and then we see a patient who is only mildly unwell who subsequently-and to our genuine surprise- becomes extemeley ill the next day. I reflect on this because of an 8 month old baby I saw this morning. He wasn't especially unwell, but overnight he had developed a dramatic increase in the extent and severity of his truncal eczema, and now he also had some small, whitish macules with a surrounding erythematous ring which looked like the beginnings of chickenpox or perhaps hand foot and mouth. I recalled a lecture from a study day at Great Ormond Street some years ago about the importance of diagnosing eczema herpeticum. It's usually associated with HSV (cold sore) infection, and is a condition that can accelerate from an apparently mild local skin infection into a severe systemic disease, very quickly. It consequently needs anti-viral therapy sharpish. 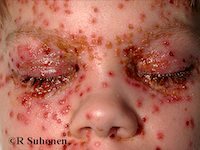 Interestingly the alternative name for this condition (Kaposi's varicelliform eruption), arose because of it's similarity to chickenpox (varicella). A couple of weeks ago I saw a young mother who'd had symptoms of laryngitis for about 4 days. She was not especially unwell but by the next day she was in intensive care with an empyema needing emergency surgery to drain a chest abscess! At the end of a consultation for mild infectious disease, I generally say, "if you worsen (I try to specify in what way I mean-in terms of intensifying of symptoms, or new and unpleasant features, or just a non-specific, 'don't like how things are going') please do get back in touch". I caught myself saying it today, and since the reality is that in general practice one is nearly always seeing conditions at a very early stage of development, patient's need to know if, and when, they should report back. I guess I've learnt from bitter experience that some patients will just accept a worsening situation simply because they have 'seen the doctor and he says I'm not too bad'. Always give simple, specific advice about follow up.